If you’re like a lot of cat owners, you know your cat’s daily routine. If you notice your cat is not following his usual activities, or if you see a change in behavior patterns, those could be subtle but important clues that your cat is sick. As a pet parent, it’s time for you to step in and get the vet on speed dial. Behavioral changes are nothing to fool around with. When your cat starts to hide, instead of purring on the windowsill, it’s time to find out why. Cats are so good at hiding pain and illness, that even the smallest changes in their behavior can be a sign of a serious problem. If one of the veterinarians at Hudson Animal Hospital discovers that your cat has a short term illness, or an ongoing chronic health issue, your kitty may need prescription medication and it will be your job to give it to them. Giving medication to a cat can be challenging when he doesn’t want to cooperate. At Hudson Animal Hospital, we are here to explain how you can give your cat his medication successfully, without stressing out your feline friend or yourself. Veterinarians prescribe medication to cats for various reasons. One of the most common reasons cats are treated with medication is for IBD, (inflammatory bowel disease). Sounds uncomfortable, and it sure is. This type of condition requires daily medications and a special prescription cat food along with lots of TLC. Corticosteroids are also commonly used for the treatment of IBD. To make things easier on you and your pet, cat medications can be compounded into a flavor tab or a flavored liquid for easier administering (and who doesn’t like salmon flavor!) Our veterinary technicians will train you on what to do and will help you manage your cat’s medication schedule. Another common reason for giving your cat medication is for infections. Whether the infection is from a wound or some other reason, antibiotics are used for a specific period of time until the infection is gone and your cat is up to his old tricks again. In some cases, pain medications are needed to keep your cat comfortable and pain-free for a period of time. A little extra care and attention, fluffing of the cat bed and some gentle petting may help the medicine go down easier. There are also long lasting antibiotic and pain relief injectables available. Talk to one of our veterinarians about these options at your next appointment. With proper instruction from our veterinary team, you can be successful at giving your cat his medication. And at the end of the day, you know you’ve done your best to make your buddy feel comfortable throughout his healing process. Cats who are hyperthyroid may be given a transdermal gel medication. In some cases this type of medication may be easier to apply for the pet owner. For administering pills to your cat, you can use Pill Pockets. These are soft tasty treats that you insert the pill into to disguise the cat medication. Pill guns are designed to place the pill on the back of the tongue where the cat is least likely to reject the medication. Some medications are available in liquid form. Your veterinarian will talk to you about dosing and how to properly administer the liquid medication. Liquids can be compounded to a flavor your cat enjoys. Some medications are available as Transdermal Gels, meaning that they are applied topically like a lotion. With transdermal gets, it is important to understand the absorption rate and pay close attention to dosing. If you have to medicate your cat for a long period of time, have a game plan. You will want to be prepared with a plan of action. While every cat is different when it comes to taking medications, most cats respond well to positive reinforcement when administering cat medications. You will have a quick window of opportunity to medicate your cat, before he changes his mind. Trying to medicate your cat on the ground is much more difficult and tough on both of you. Place the cat comfortably on a high table. Most vets have a well stocked pharmacy for their patients. It is best to get your pet’s prescription filled at your veterinary hospital. Some drugs that need to be compounded or flavored have to be made and then either picked up or mailed to you. For refills on medications, call your veterinarian. Your pet may need to have occasional blood tests to make sure he is on the correct dosage throughout the prescribed treatment. What is Prescription Cat Food? Prescription cat food is formulated for specific health issues your cat may have. There are certain health conditions that will benefit from prescription cat foods. These foods are formulated by veterinary nutritionists. Your cat my turn his nose up at first when you introduce a new food, but it’s all for the best. What should I do when my cat displays unwanted behaviors? Human sometimes don’t have a clue as to why their cat has suddenly become a “totally different animal.” Is there anything I can do to help guide him toward a positive behavior? There are many behavior modification medications for cats. It depends on what behaviors the cat is displaying. There are also some natural pheromones that can be used for behavior problems. A combination of behavioral medicine and behavior modification techniques is a good starting point to help your cat overcome negative behaviors. It may take time for your cat to respond to the medication and time to learn new positive behaviors. It takes humans time to learn new behaviors too! If you think you may be noticing a change in your cat’s behavior, please call our office at Hudson Animal Hospital and make an appointment. Even the smallest changes in behavior can indicate that your cat is facing a significant health problem and may need medication. If your cat is already on prescription medication, we would be happy to supply you with refills. 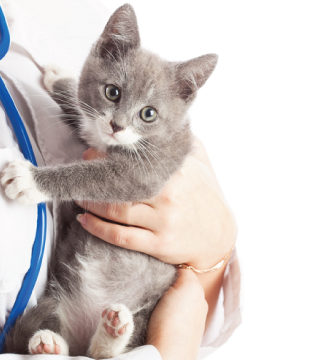 Talk to one of our veterinarians about prescription cat medication at your next appointment.